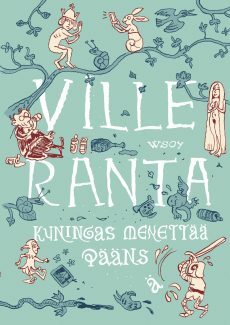 The concept of being a man is torn to shreds in Ville Ranta’s new, guillotine-sharp-witted graphic novel. The King is losing faith in everything around him: the roof of his castle leaks, the court jester fails to amuse him, no one shows him any respect. Thankfully, the Vicar knows the cure for the King’s existential depression; and so the unlikely duo embark on an adventure, one final time! The beer flows, dragons are slayed as women and castles are conquered. King Loses His Head is a wildly-imagined work of surreal wit, one that shimmers with pastel coloured illustrations and witnesses the severing of the head of the alpha male. Full English (unedited) translation available.